When I was growing up we had pretty strict rules regarding table etiquette at dinner time. I don't remember going out to eat much. Stir fry was done at home in my mom's old red wok, pizza was made from scratch and without fail turned out to be a lopsided rectangle. Pancakes were made from scratch and cooked on a tabletop griddle. No matter the menu, the rules were always the same. Elbows off the table, appropriate subject matter, speak minimally, the less audible the conversation the better. As an only child I didn't have much to occupy myself during the meal. When my parents conversations about IBM and volunteering at the library made me want to scream or talk about Duran Duran's latest album I stared at the bird feeder outside the window. Once in awhile my parents would pause their conversation to remark on the type of bird. "Today I wore a tie to work for the 12,000 day in a row and- Oh! Look! A chickadee!" As the weather got colder I'd sit in front of a bowl of homemade split pea soup the color of my mom's kitchen cabinets and wait for a certain bird to arrive. It was the highlight of 52 weeks of mature dinner conversation. "Tonight on my way to the library I stopped at- Oh! A tufted titmouse!" Such inappropriate commentary! God, I loved that bird and the 10 seconds of giggling it allowed me. Now I'm a parent and I find myself getting uptight at the dinner table if the kids start acting, well, not acting up per se, but acting like they have a pulse. Mistah Checka's mom was a single mother and she raised 4 intelligent children who were left to their own devices from time to time. He thinks nothing of breaking out into song at home when we're eating Mexican food. "Beans, beans they're good for your heart! The more you eat the more you fart! The more you fart the better you -"
"STOP IT RIGHT NOW!" I say in my best impersonation of my mother circa 1982. Mistah Checka had to look up the words to Rock A Bye Baby on the web after our first child was born, but I bet he can recite tons of off color psuedo rhymes from memory. Today we ventured downtown to mill around with 200,000 other aimless shoppers. Uninspired by the beer tent, the fried chicken tent and the pulled pork tent, we ducked into a bar to get lunch. We chose that bar because they make good sandwiches and they have a giant fishtank. Grabbing a prime piece of dining real estate, we plopped down in the booth in front of the tank. The kids were entertained by the various salt water fish and Mistah Checka and I were able to stare at the menu. We ordered one peanut butter sandwich on wheat, one grilled muenster cheese on wheat, one grilled provolone and tomato on rye and one turkey and avocado on rye. Side order of sweet potato fries all around. Still no lunch. The place was slammed or else I would've complained. Instead, I kept myself busy making sure the kids were behaving. "Look at the angelfish! Wow, that fish sure swims fast!" At the table behind us a toddler was screaming and his parents were alternating turns of putting their hands over his mouth as they continued to eat. A lady at the table next to us commented on how well behaved our kids were and asked them "Do you always get along so well?" They both nodded yes and I was proud and knew my mother would be proud. "Hey, that's a HUGE ENEMA!" As I sucked in air and the surrounding tables got quiet, he glanced at me and looked scared. "What was I supposed to say?" "Anemone" I answered and hid my face in my napkin. As I mentioned the other day the veg4fam planned on doing a lot of dining out in the upcoming days, in order to avoid making a mess in the kitchen. Friday morning I was going to begin my city wide restaurant tour by joining two friends for coffee. Yet, I've got a sick 8 year old who woke up and looked at himself in the mirror and said "Mom! What happened? I used to be tan, now I look so PALE!" Then he bent over and vomited. Looks like I was staying home. Sigh,I don't even drink coffee anyway, so I cancelled the first stop and replaced it with a trip to get ginger ale and crackers. For lunch I was going to visit a new grocer down the street and pick out a deli sandwich. Instead I am eating oyster crackers with him while watching "Tom and Huck". Last night I thought we might visit a place downtown but instead we made homemade calzones. Miraculously we didn't make a mess, which is surprising given the combination of cornmeal, pizza dough, shredded cheese and pizza sauce. Today I hoped to make a 2nd attempt at the culinary tour of Tucson. It's a great city to try different cuisines, I wish that more people who visited would steer clear of Cracker Barrel of Crap and such. However, we are the midst of a hell driven wind storm. Tumbleweeds are zinging across streets like wooden space ship frames. I walked outside chewing a piece of gum and it became crunchy with dust. Looks like that is going to be my lunch for the day because once again, the veg4fam ain't going no place. So when the wind dies down, the children stop being contaminated and the stars align in a pleasing manner, I might try again. The following list is only partial at this point. Consider a good stepping off point if you should ever be in Tucson. Hotel Congress: Located downtown on Congress Street. Saw a fantastic show there last fall, with the highly annoying Living Things opening up. Meal of choice: Portabella mushrooms stuffed with herbed goat cheese and pine nuts, roasted garlic white bean puree, sauteed spinach, & red bell pepper coulis. Janos: Located in the wonderful Westin La Paloma resort. Meal of choice: Layers of roasted peppers, chiles, braised fennel, mushrooms, grilled eggplant and chevre with balsamic reduction, golden tomato vinaigrette and blue corn bread salad with heirloom tomatoes and panela, drizzled with tepary bean vinaigrette. If I could return a second time it would be to J Bar, adjacent to Janos. They serve mojitos, something I accidentally found out that the above mentioned barf boy enjoys. "Gee Mom, this is refreshing!" "PUT THAT DOWN!". Meal of choice at J Bar: Venezuelan corn cakes. A restaurant that actually has more than one locale, North. Meal of choice :basically just their pizza, but the views are endless and the loft style decor makes it worth the $150 we spent last time we visited. And no, the pizza is not that expensive. Another great place to grab pizza is the aptly named Sauce. When five of the ten pizzas are veggie friendly, I'm bound to like it. Okay, now I'm hungry. What's your favorite restaurant? Today our house went on the market, so as soon as the For Sale sign was hammered into the ground I announced to Mistah Checka (who was preoccupied with his thesis) "T-minus 45 minutes and counting!" He looked up from his desk with a quizzical expression and I clarified by saying "I am kidnapping you! For lunch!" Ahh, after weeks of prepping the house for sneaky, nosey, non-preapproved for a mortgage folks that are soon to descend upon us, I was in need of some bakery therapy. My hands were practically worn down to a nub after painting every floor board in the house, but I was able to wrap my hands around a veggie sandwich with cheddar, avocado, lettuce, tomato, sprouts and jicama. Fire roasted tomato soup topped with tortilla strips and sour cream sat steaming at my side. The food was so good I was able to overlook the complete lack of ice at the soda dispenser. It was also so good that I lost my common sense because as soon as Mistah Checka finished his BBQ roast beef panini we walked up the block to the market. I meant to just pick up some snacks for our upcoming trip this weekend. Dried apple slices, check. Date nut stick thingies, check. Next thing I know my overstuffed brain is thinking we should pick up some items for dinner tonight. Mistah Checka has been a tad bit overworked between opening our pool, washing the windows, making numerous runs to the storage unit while working on his thesis and upcoming Monday morning presentation in California. I thought I would be a good wife (why? WHY?!?!) and make a nice dinner. As soon as we drove up to the house with the paper bags full of groceries it hit me. I don't want to cook in this house! This house is for sale! Strangers could be stopping by at any moment to see how spotlessly we live. Here's the thing. We don't live spotlessly. More like hopelessly. As I explained to our realtor this morning "This is my house, not a museum". And then I showed her my pantry but neglected to tell her I spent 2 hours cleaning it. I'd rather she think you could always eat off my pantry floor...and you could, but it would probably be a piece of kibble that fell out of the dog food container. After the kids got home from school today I wanted to make some cookies with them. Cookies are easy. They can get popped in the oven. They smell yummy. They make people want to buy houses. Only if you don't put two sticks of butter on top of your preheating oven so they can "soften"...all over the black shiny surface that your husband polished that very morning. Only if you use the correct size bowl so that when you turn on the beaters brown sugar and melted butter don't fly all over the the island counter you wiped down that morning in order to take MLS photos. It took me so long to clean up the mess that before long it was time to start dinner. The phone rang half way through prepping and it was my mother in law. Even though I did just take her to an Oscar Night party I wasn't going to miss a chance to show her what a great wife I was to her son. "Oh sorry, I can't talk for long! I've got oatmeal/raisin/butterscotch cookies in the oven and I am steaming artichokes, boiling potatoes, cooking corn on the cob and simmering some veggie ground beef and also some veggie chicken strips!" After I hung up with her it was time to bring out the carnivore's food. I took the butcher paper package of bison out of the fridge and did a double take. I swore I saw "Fresh Guts" printed all over the paper. That wasn't the case, but it wouldn't have been far from the truth. I melted the butter and squeezed the lemon juice for the artichoke and hoped that it wouldn't spill all over the table just before someone rang the doorbell. Tomorrow night we are eating out. And the night after that and the night after that. I can't handle the stress. I hope we sell our house soon. I'd hate for all the profits to go towards paying back the food portion of our credit card statement after eating our for every meal. Screw being a good wife. Screw being a good daughter in law. I'd rather be a good customer. I love cookbooks. I read them constantly. I sometimes soak in the bathtub while reading them. The edges of the books are swollen from where the pages have touched the water as I envision expertly executed recipes arriving on the table simultaneously. A table that two freshly scrubbed children have set to perfection. There's fresh flowers, matching plates and dare I say- napkins! Then I drain the tub and float the little whirlpool back to reality. 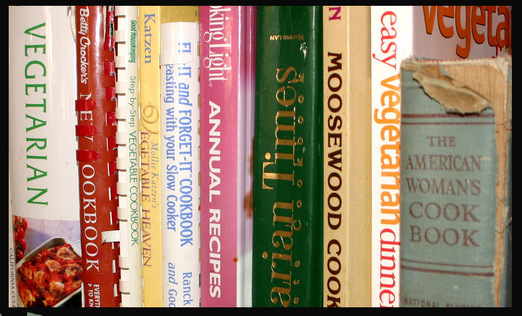 A reality of tons of cookbooks housed within old pear crates on my kitchen counter. Millions of recipes that have never been brought to life in my kitchen. Sometimes, like Martha says, that's a good thing. Take the cookbook on the far right of the picture. It belonged to my grandmother in the 50's. Tasty morsels like Rinktum Ditty and Golden Glow Casserole are forever preserved in those pages. There is even a section on preparing...(please don't let me get coal in my stocking this year for mentioning this) REINDEER. Sorry, Santa. Maybe the Golden Glow Casserole can light the way instead. The morning after Halloween. It's hard to fathom, but there are still bags of candy left. I calculate that it will take the veg4fam until Groundhog Day to make a dent in all of it. That calls for extreme cleverness. The candy must be incorporated into our meals in nutritious ways! Just like parents sneak veggies into sugary baked goods, but exactly the opposite. Sugar snuck into healthy food! Pure genius! Recipe #1 to come out of the post Halloween veg4kitchen. Toasted peanut butter and raisinet sandwiches for breakfast. Even in Arizona there are seasons. Subtle, but they're there nonetheless. He replies with a smirk "Ma'am, apple cider is a seasonal thing"
"Sooo", he says while looking at me oddly "since it's seasonal you should check back during that season"
What the hell? This is Arizona, not damn Australia. Is apple cider not a popular AUTUMN drink? Anyone ever have cider for say, Easter? Fourth of July? I hate when idiots think I'm the stupid one. The veg4kids and I stopped for lunch at Subway on Friday. Subway's not glamorous, it's not quaint and they are always found in some strip mall alongside a nail salon and real estate office. However, it's cheap and my kids will get (and eat!) a somewhat healthy vegetarian lunch. When other families are taking their kids to McDonald's, we are sitting at Subway. There's a Subway close to our house that is in a relatively upscale location. The husband and wife team that own it are very sweet and the shop is always immaculate. They have fresh veggies, unlike some Subway's that I've eaten at where the tomatoes are the color of a slightly sunburned albino and the lettuce is so limp it needs crutches. I also like this Subway because we've recently gained the status of "regulars". When we walk in the door they are already pulling out the kind of bread we like to make our subs with. "Three six inch long veggie sandwiches on parmesan oregano bread?" they ask and get my smile in return. My sandwich has provolone, black olives, cucumbers, green peppers, pickles, carrots, tomatoes, spinach and a smidge of salt and pepper. Noodle likes his just like mine, minus the spinach and seasoning. Cakes will eat only american cheese, carrots, black olives and cucumbers. A while back I was ordering these sandwiches and evidently forgot an item because the owner looked over the counter at me and said "Didn't you want carrots on her sandwich?" It ain't fine dining, but when you're brain is fried in the Arizona sun it's nice to know the gentlemen behind the counter has got your back. On Friday afternoon, as we were sitting there eating our yummy subs made with love, two teenage boys walk in and stare at the menu selections on the wall. My favoritest subway owner is waiting patiently behind the counter. Finally the one kid says to the owner "Yeah, hey Jared (as he turns to smirk at his buddy who is giggling) lemme get one of those chicken bacon ranch sandwiches"
I had a mouth full of bread (and maybe some chips!) so I couldn't say anything, but holy mother of the sandwich gods, did he just call the guy behind the counter JARED? What an imbecile. To the best of my limited franchise knowledge, Jared never worked at Subway- he just ate there. I sat there stewing in my thoughts and got angrier and angrier as I imagined him ordering pizza and saying "Hey yeah, Papa John, lemme get a large pepperoni to go". I was so busy conjuring up idiotic conversations in my head that I totally missed my chance to trip him after he grabbed his sandwich and headed out the door. What possesses these losers to mess with people that are making their food ? Just when you thought it couldn't get any worse than this. I went ahead and decided I would get a head start on the sangria recipe I was making for the party. I gathered my ingredients, I was all about the mis en place. One bottle of cabernet sauvignon, one bottle of blackberry brandy, a cup of OJ, a few slices of lemons and limes. That's when I realized I've never opened a bottle of wine in my life. Where the hell have I been for 34 years? I showed the bottle to Mistah Checka who spun the foil wrapper around and around and looked at me and shrugged. So, I did what any respectable woman would do. He explained to me how one goes about opening a bottle of wine and instructs me to find the corkscrew. As I am digging through the countless drawers of kitchen gadgets that I own (ask yourself Why? right at this juncture) I ask him "Wanna hear about my coffee making attempt?" I locate the corkscrew, attach it to the bottle per Papa's instructions and yank on it as my Dad says "Be careful not to break the cork!" "Ummm. Dad? 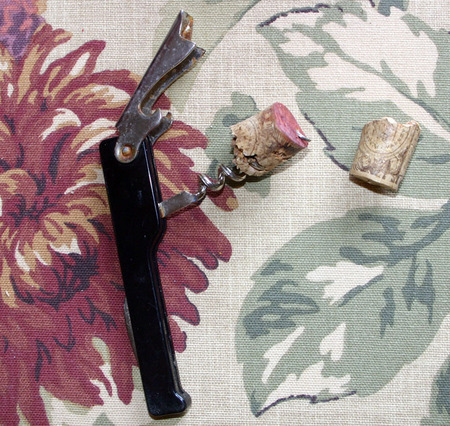 I broke it"
Daddy doesn't like stressful situations and I guess at 9 pm on a Sunday night, a broken cork via a 3,000 mile away phone call ranked up there as highly annoying. He said his goodbyes and left me with a dial tone and a half a cork stuck in a bottle of wine that I never planned on tasting. I like wine only slightly more than I like coffee and barely more than I hate meat. I finally succeeded in getting the cork out. Here's a picture of the entire fiasco on one of my newly reupholstered chairs. Believe it or not, I am quite handy with a power drill and a heavy duty stapler. Note the massive amounts of rust on that corkscrew, it looks like it's seen a lot of use, doesn't it? I have to host a party tomorrow night. I absolutely cherish the IDEA of a party. I love the planning, the creative ideas I think up in the middle of the night, the trips to the store to pick out just the right items. I just happen to loathe all of the not so fun aspects of party planning. For me, the not so fun parts are serving food and drinks to 15 people. In my house, drinks are either juice, water or diet soda. Food is usually along the lines of soup or grilled cheese with an occasional 3 course meal once a week. I know these people coming to my house are coffee drinkers. I however, am not. I made a cup of coffee out of an instant pack and some hot water when I was 15. It was around that time that I was also rolling up pieces of loose leaf paper and sticking my head out of my bedroom window to light them on fire and smoke them. I knew that I was not in fact smoking, but I thought I should practice should I decide to become a true smoker. So, I made it about 3 sips into a bitter cup of sludge, choked on some ashes from my psuedo cigarette and declared it all a waste of time. Now I am facing my nemesis once again. While I can insist there is no smoking within the walls of my house, I can't very well declare it a "coffee free zone". I own a coffee pot that my mother in law uses when she comes to visit. All I had to do was purchase the coffee. Once I brought home the 2 bags of coffee (one unleaded, one regular) I started to get palpitations at the mere thought of actually brewing coffee that someone would intend to consume. So, I decided to do a practice run. That is when I realized that I had nary a clue when it came to coffee making. I stared at the pot and made a mental list of the things I would probably need in order to execute a perfect cup a joe. Next, I found a filter in my pantry, opened up the coffee, and measured out some grounds. Okay, I know a cup of coffee has coffee in it, what else? Water! So, I filled up the glass carafe with water, inserted the filter into the little tray and turned on the machine. Ten minutes went by and there was an intense smell of coffee, but the water was still clear. That's when I realized that the grounds and the water probably had to be together to magically change into coffee, so I took out the filter tray and poured the water from the carafe into it. Water and grounds streamed out of the filter basket all over my feet. Turns out there is a little hole at the bottom of the filter tray. Sombitch. After five minutes of mopping up that mess I had a revelation! I poured the water into the container in the back of the coffee maker, added more grounds to a fresh filter and sat down to wait. I don't particulary like the smell of the magical process of coffee. Once we had purchased some expensive coffee from a gourmet shop to mail to my mother in law for her birthday. The next morning we inched our way around the house trying to find the hidden pile of dog poo that we were sure the dogs had left somewhere. When we finally zoned in on the offending smell it was none other than the sealed bag of coffee. Finally, the coffee was done. It actually didn't even smell half bad. I grabbed a mug, poured some out, let it cool a bit and then took a sip. Make that two times that I mopped coffee off the floor that night. I know now for a fact that you coffee drinkers were born without taste buds. What gives? How do you do it? Pass me a cup of tea and tell me your secrets.